Last week, I tackled yet another source of paper clutter, our mail. I explained what purpose each section served in our mail sorter: inbox, to do, recycle and so on. 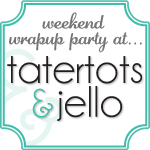 I had also wanted an area for things “To Keep”: paper that didn’t need to be filed away, like take out menus or wedding invitations, or baby announcements (because apparently we’re in that stage of our lives!). I had already planned on making a memo board, so I realized that would be the perfect place to keep and display them! I started out with two 1’ by 1’ cork boards from Walmart (the same ones I used for our receipts post back in February). I had some leftover fabric from my jewelry box. 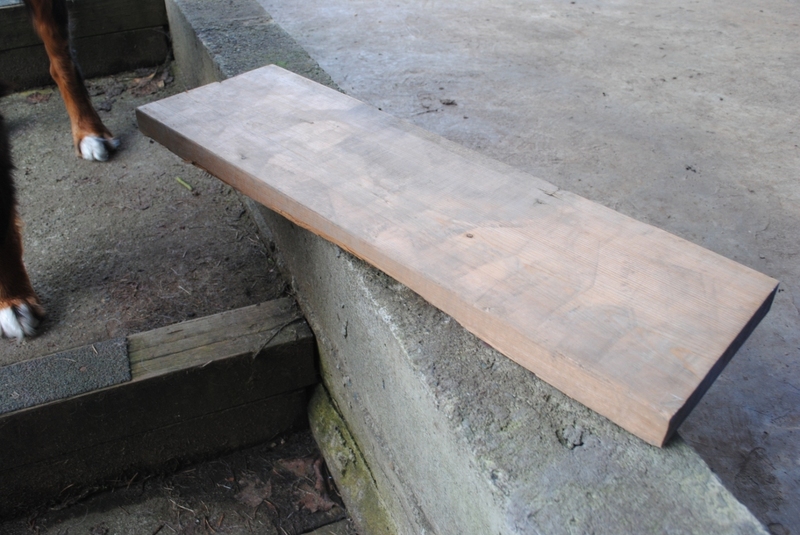 I cut it to size to just fit past the boards, and gave it a quick press. I thought about stapling or adhering in way that was more permanent, but I was too impatient. I had purchased some white tacks for the board. 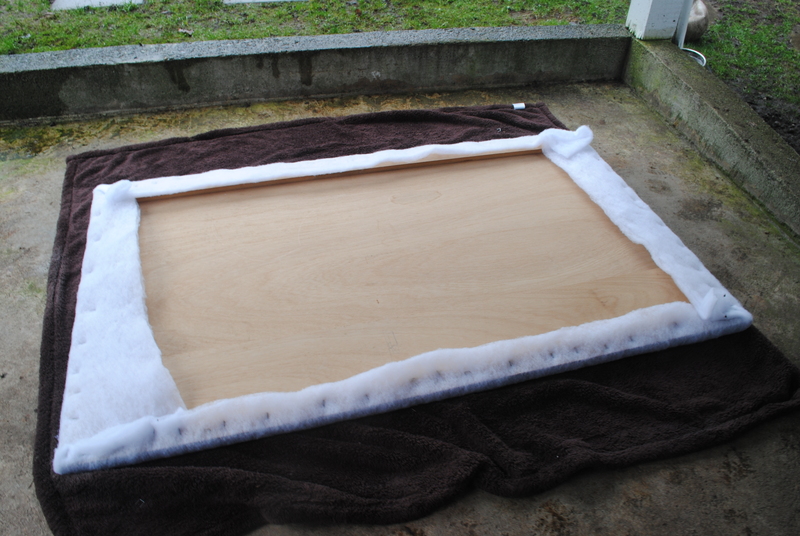 Since they were flat, I was able to use them to attach the fabric to the back of the cork board. I did one side first, the continued pinning around each side so that the fabric was flat and snug against the cork. 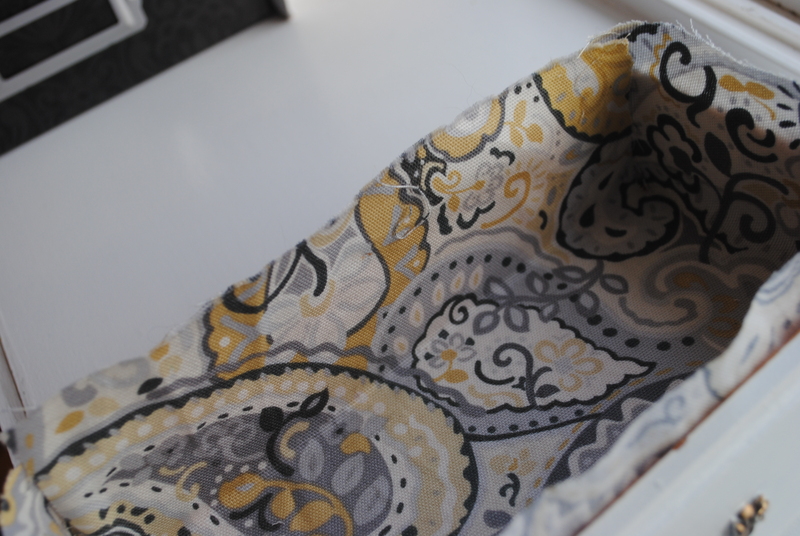 To do the corners, I simply folded them like I would a present, and tacked them in place. And finished my tacking any loose sections along the sides. Flip it over, and done! Now I can post whatever little flyer or bit of info we’d like to keep handy here (especially if it’s too heavy for a fridge magnet). It adds a fun bit of visual interest to our hallway too. Our bathroom is definitely in need of an update… Nothing like a picture to help you see it through new eyes! I’ll be sure to share a cheap rental “make over” of it in the coming weeks. 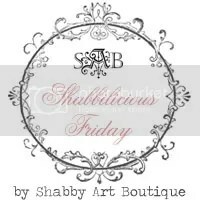 In the meantime, check back Friday for my favourite finds of the week! What did you get up to this weekend? 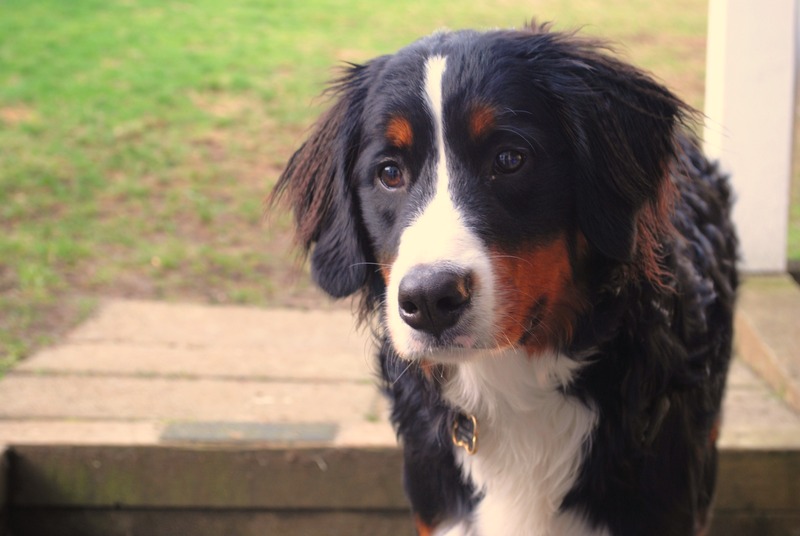 Any updates on your home? Manage to get any progress done on some of your projects? I made progress on quite a few, but none are quite complete at this moment. That being said, I just HAD to share my newest DIY project purchase that I am way too excited about! Quick intro: I really can’t stand television. I know many people find this strange. I just hate the thought of endlessly and mindlessly watching tv, and especially can’t stand the noise of it in the background. Shaun, on the other hand, is a complete tv-lover. Knows of every show, follows a number of them and can name a pop culture reference on a dime. (I of course rarely catch them.) We haven’t ever owned a television together, but finally, I acquiesced. He’s such a Canuck fan, I guess he needs one. However… A new tv also means new tv furniture. 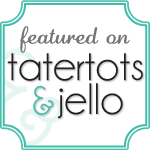 Now you have me interested! I’ve contemplated what style to choose for quite a while. If you follow me on Pinterest, you may have noticed more than a few mid-century modern credenzas popping up on my boards. I’ve been on the hunt for a while, when finally… Saturday morning… I found it! 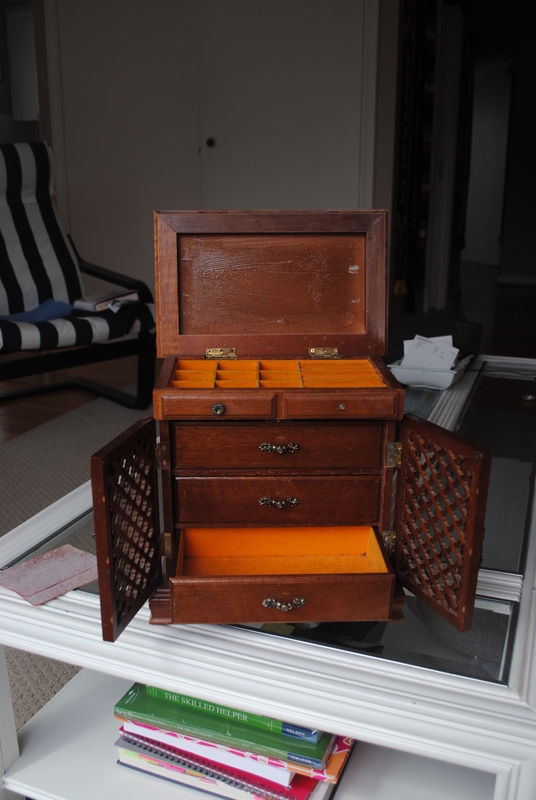 I had seen so many refinished pieces for upwards of $700 (to $1400! ), so for $100, I was sold! I don’t know the full “story” behind it, but the girl I bought it from said her aunt found it at antique store in the Okanagan (about 4 hours east of Vancouver). That’s enough character for me! The thing weighs a TON, but we managed to get it into our living room. The top is in worse shape with water stains, wax and more than a few scratches. I did manage to get the wax off (I literally just spent a while scratching them all off with my nails) and even got rid of the surface stains! Magic eraser can work WONDERS. I worried Magic Eraser would ruin the finish or the stain of the wood, so I tested in on more than a few inconspicuous spots. 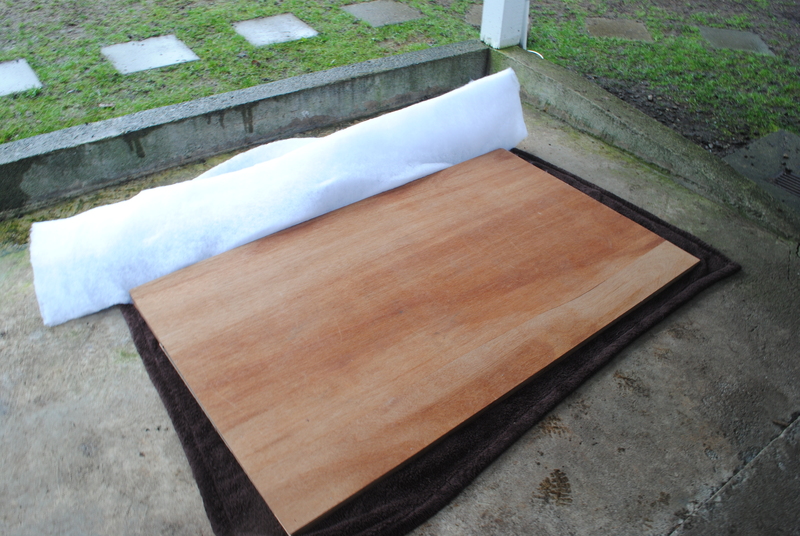 As a quick tip, if ever you use it to clean old furniture, make sure to wipe it off with rag once you’re done. I didn’t at first, and with the thin coat of caulky white that remained, I worried that I had ruined the finish! I wiped it off, and thankfully, I hadn’t. What other steps do I plan on doing to make it work for us? 1. I’ll probably sand it down to get rid of the rings and deep scratches, at least on the top. 2. I’ll refinish it in some way, but I’ll have to wait to see how it looks once it’s sanded. 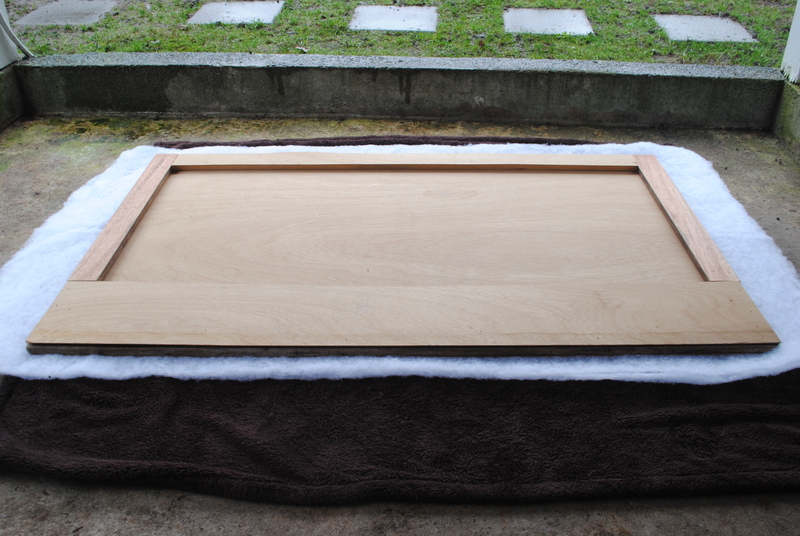 I’m not sure if I’ll have to stain the sanded areas to match the rest of the piece… Hopefully not. 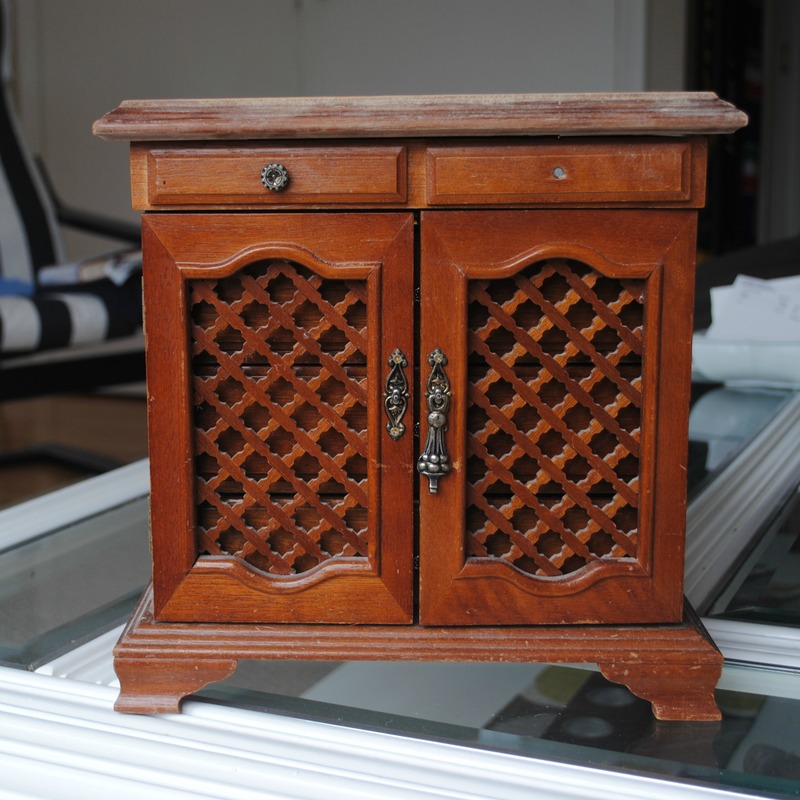 I thought about staining it a darker colour, but I actually like the more vintage look it has now. It works well with some of my baskets and my salvaged shelves. I know I’ll be varnishing or oiling it (something along those lines) as the wood is dry dry dry. A bit of a list… But I think it will be so worth it in the end. I’m happy to be able to find unique pieces and give them new life. More character and more sustainable. 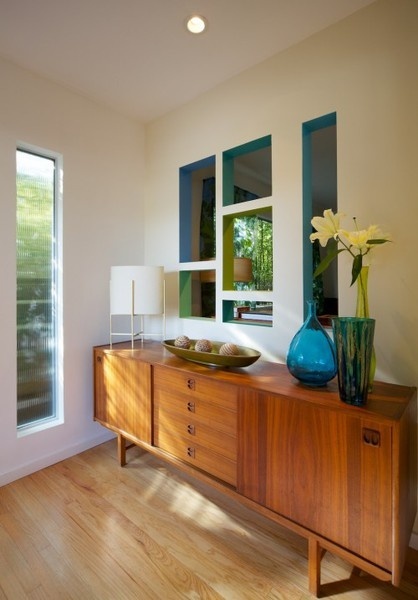 Just for fun, I thought I’d include one of my inspiration photos to show how lovely mid-century modern credenzas can be! 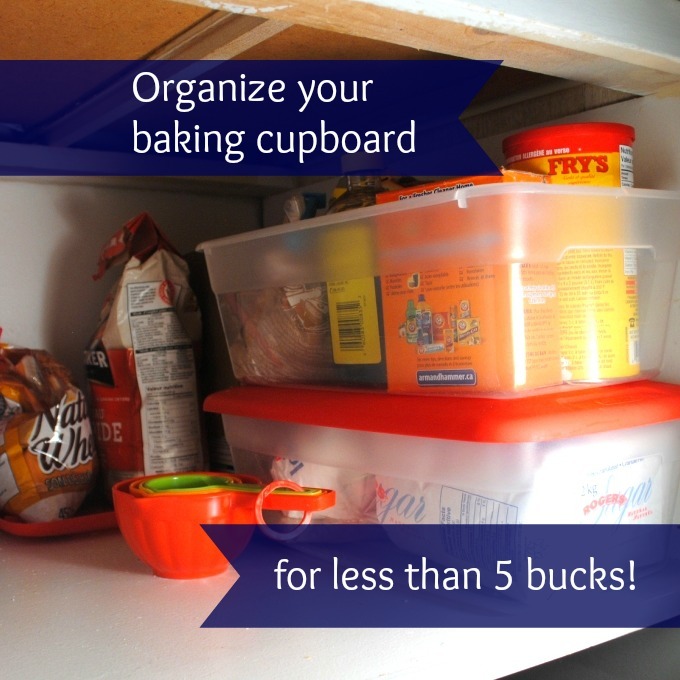 Organize Your Baking Cupboard… For Less Than Five Bucks! First post at our new place! The move went surprisingly smoothly (other than the considerable goose egg I managed to give myself while cleaning) and our lovely friends got us moved in in half a day! We’re still unpacking the last few things, but it’s coming together. 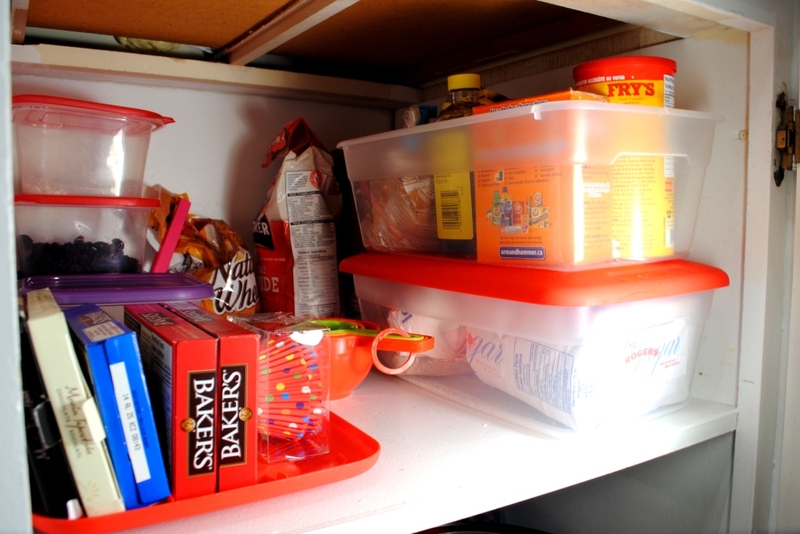 One of the most common challenges renters face in an apartment is storage space, especially in the kitchen. We have a mini kitchen (6 by 7 feet), with a mini fridge, a mini stove, and happily, a mini dishwasher. 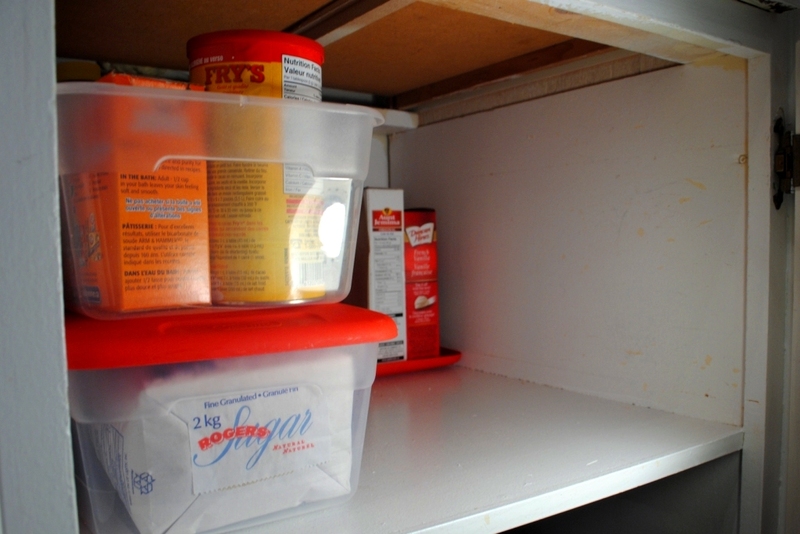 Like many rental buildings, our unit also has the cheapest building options, like basic cabinets instead of functional drawers, which makes storing my ever increasing pile of stuff even trickier. I needed to make the most of the cupboards I have, but I wanted it to be transportable, quick to set up, and budget-friendly, so fancy installed organizers and attractive uniform jars were out. I’ll be honest and say that my solution for my baking supplies may not be all that pretty, but is hardly dents my (much more important) decorating budget! I started out with a small, basic, one shelf cupboard. Other than my measuring cups, everything is corralled on either a lid or in a container. I have a tray for baking chocolate (I realized I have quite the collection once it was all organized! 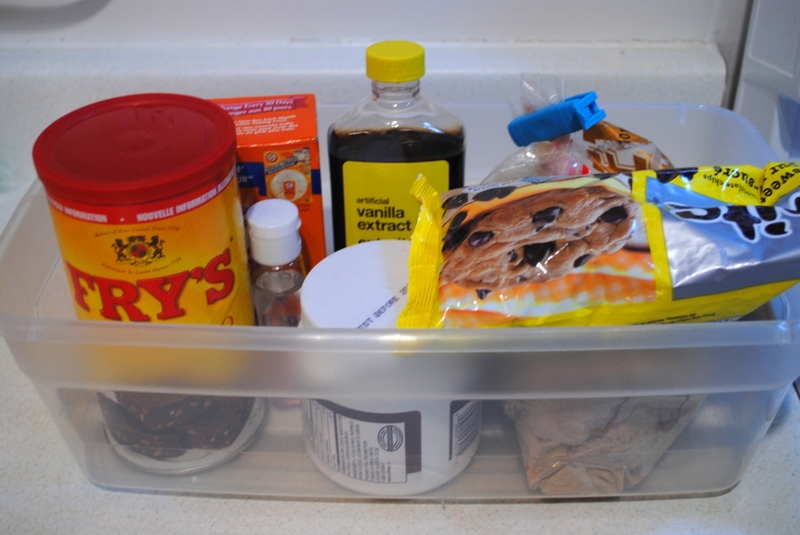 ), a tray for my bulk food, a tray for my oats, bran and cake mix as well as two large containers with sugars and frequently used ingredients. 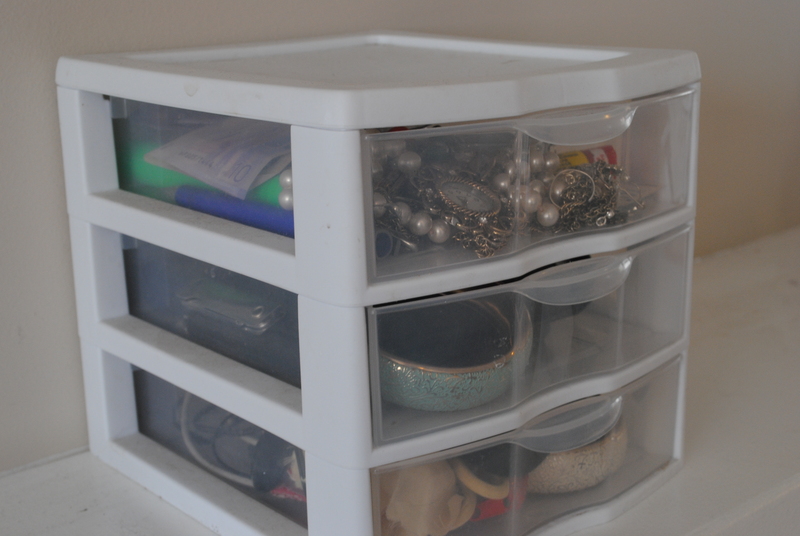 Instead of digging around trying to reach for something specific, I can simply pull out a tray or container like a drawer. 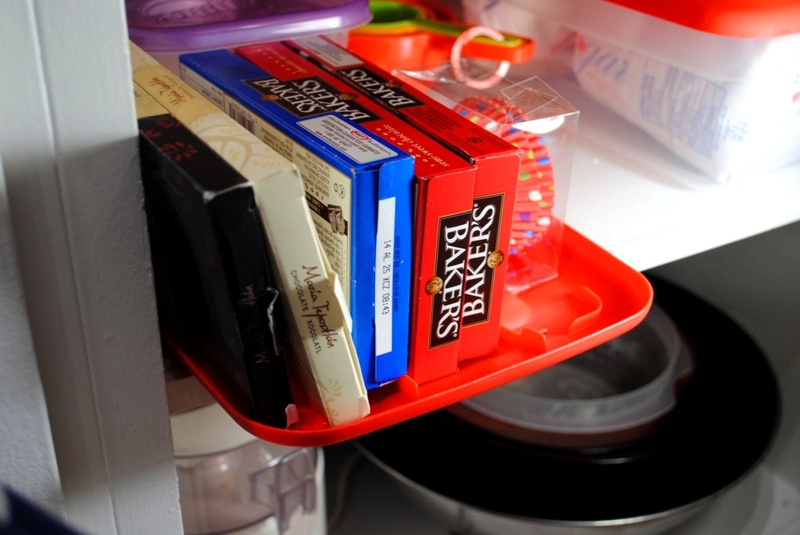 Not only is it temporary, I can also move trays around like a rubik’s cube to easily reach the food in the back. I put all my bulk ingredients in clear ziplock containers so I could easily see how much I have left of each. Now they’re also sealed, (as opposed to loosely held in plastic bags like they were before) and make much better use of the vertical space. 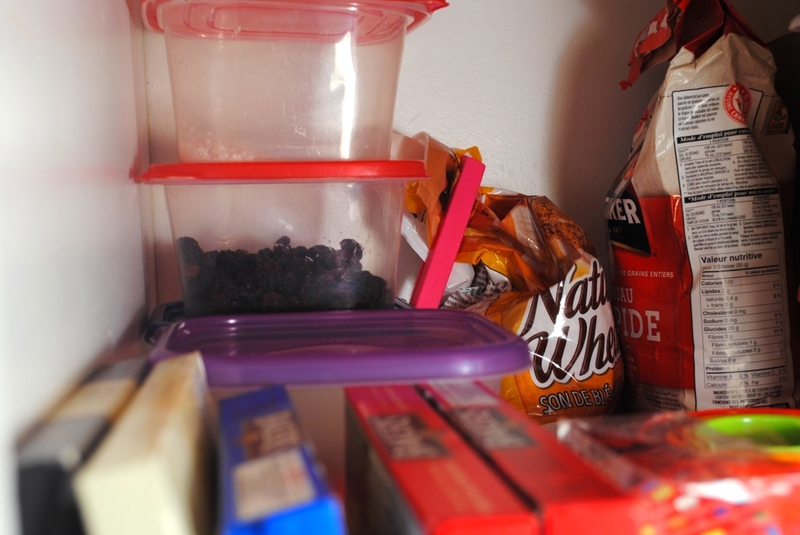 I know it would be nicer to have my oatmeal and bran in Tupperware too… which I may someday do. But this is all about keeping things as cheap as possible! 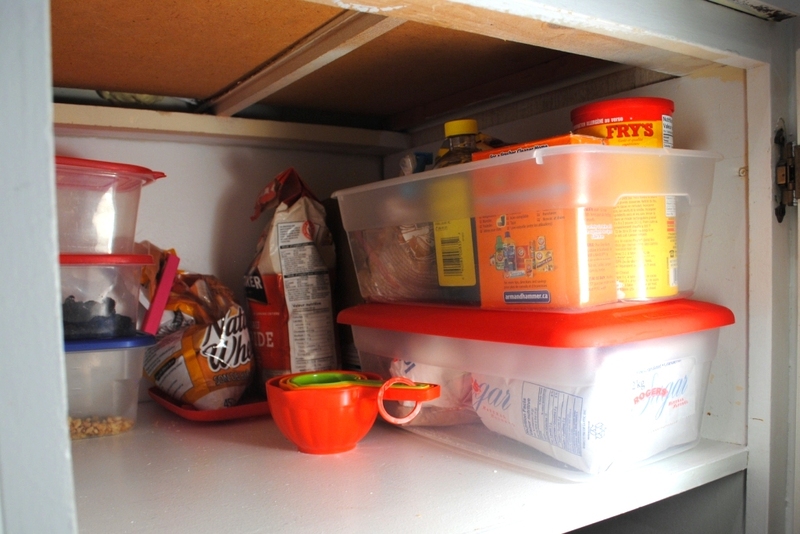 Since they’re on a tray, (ie lid) hey’re still easily accessible, so the Tupperware wasn’t really all that necessary. As for the large containers, extra white sugar (you can see my pretty jars of flour and sugar on display here), powdered sugar and so on is at the bottom. 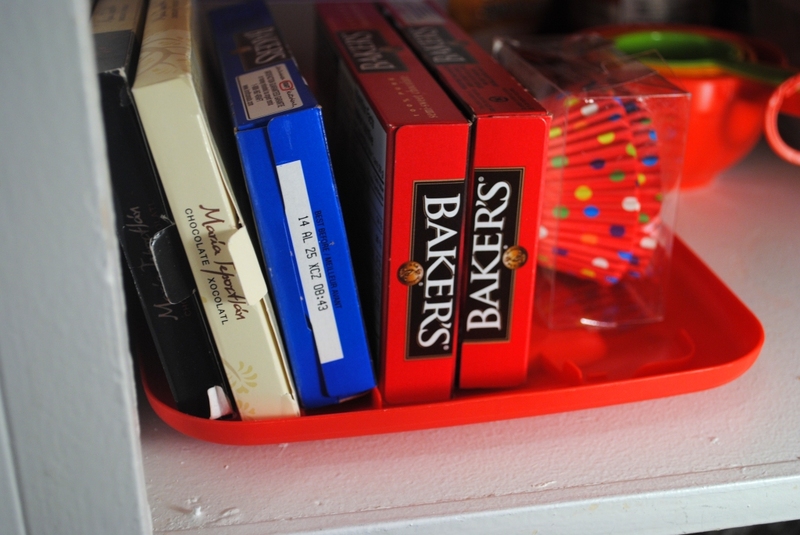 The top one holds all my most used baking supplies: vanilla, brown sugar, baking powder and so on. I just pull out the box, bake, and quickly put it all back! Having a quick clean up and easy to find ingredients makes baking a lot less daunting and much more enjoyable. I’ve been using this system for a while now and I’m still happy with it. This whole cupboard suits me because it was easily customizable to my needs, I can reuse the Tupperware somewhere else (transportable and sustainable) and cheap! What little systems have created that work well for you? 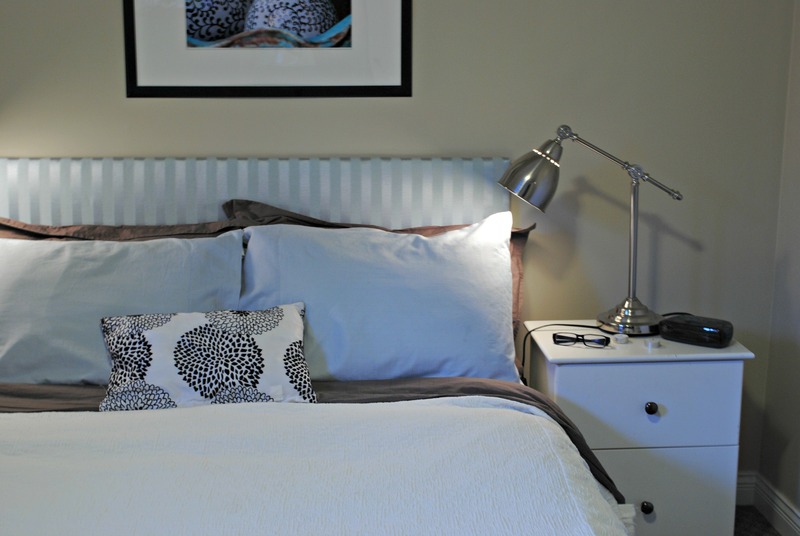 How do you make the best of small space storage? Hours spent reading I Heart Organizing has made me (embarrassingly) obsessed over pretty labels. I just don’t want to buy, or have to store, any of the fancy equipment to make them. When I saw this pin on from the Painted Hive a while ago (nothing special needed! ), I was inspired! 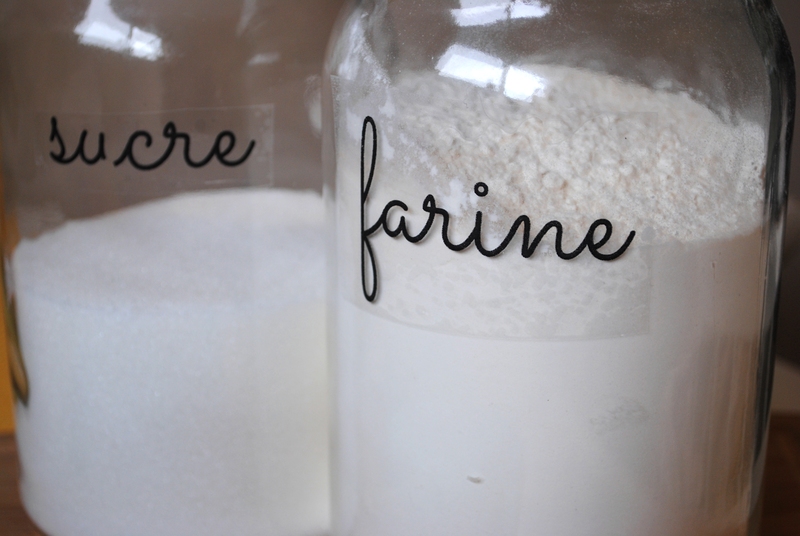 As geeky as it might be, I love the look of uniform jars on display, especially with personalized labels. I’ve been thinking about trying it for a while, but it was my new shelves that motivated me to actually do it! This project would be perfect for a few storage items in my kitchen. 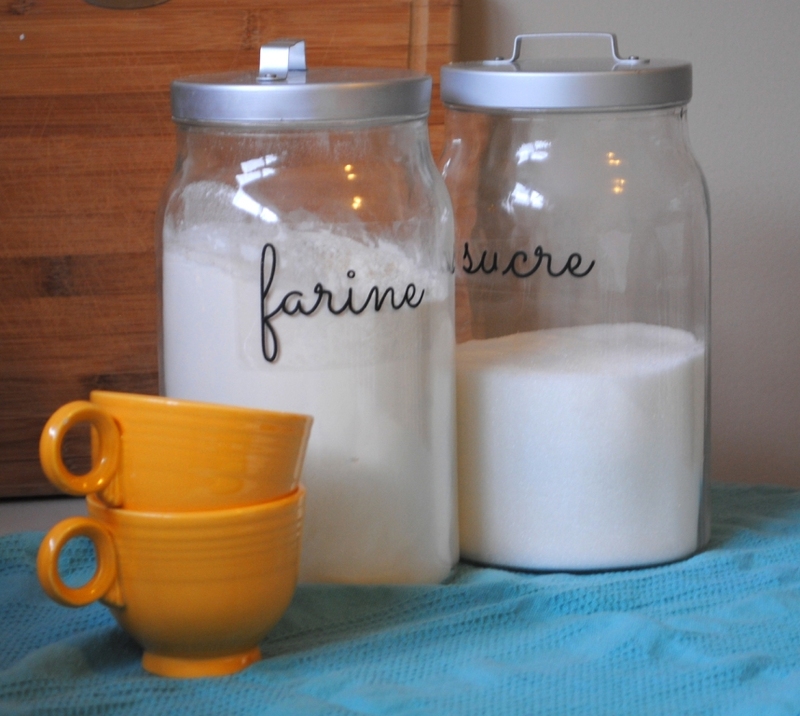 First off, I wanted to create storage for my sugar and flour. Currently, my enormous bad of flour from Costco is sitting in our corner cabinet behind some small appliances and is impossibly heavy to lift. So instead of taking it out, I reach in with a measuring cup, grab as much as I can, and spill some on the way out. Not ideal. Ok, but I think they have more potential. 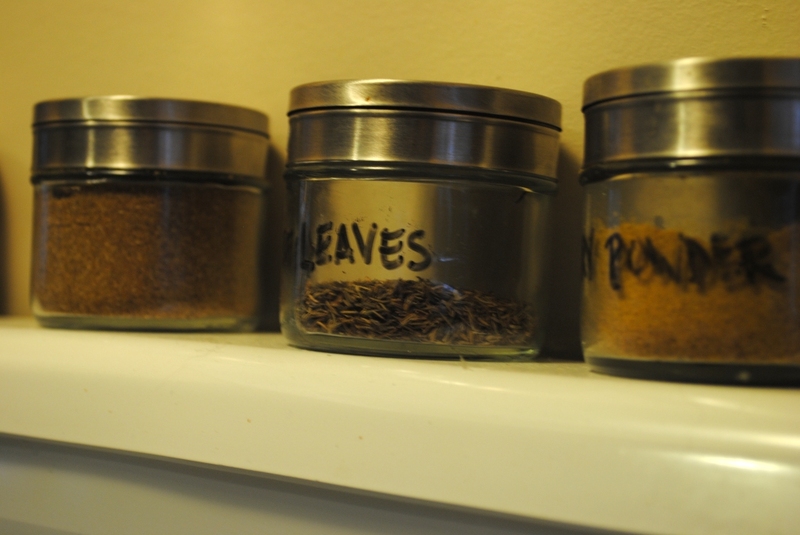 I also wanted to update our spice rack. At the moment I have them labelled with a dry erase marker. I used this just in case I ever decide to switch out the spice, but the writing just ends up rubbing off whenever I pick one up. I’ve been slowly building up my spice stash. 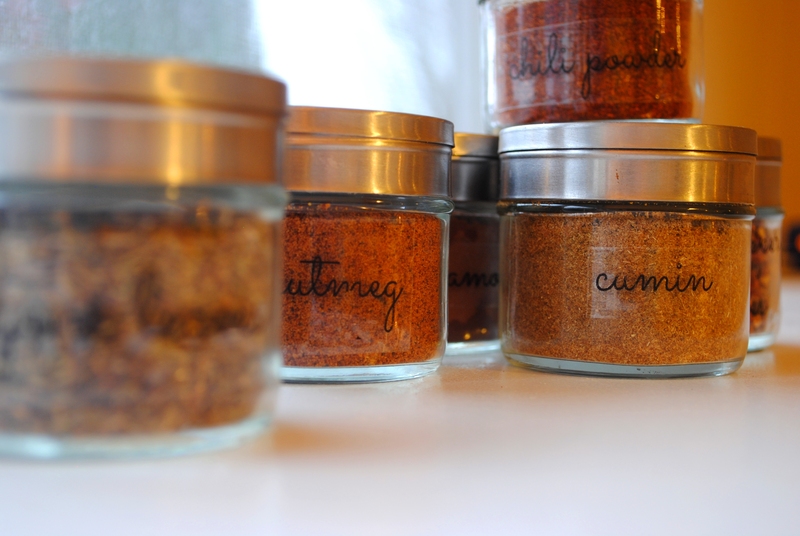 After using them for the last year, I have a much better idea of what spices need to be within easy reach, and so I feel more confident creating more permanent labels. Note: Unlike the Painted Hive, I only used the decals, not the magic paper, to make it permanent. I would certainly advise using magic paper as well if you plan on doing this to any often-washed dish. 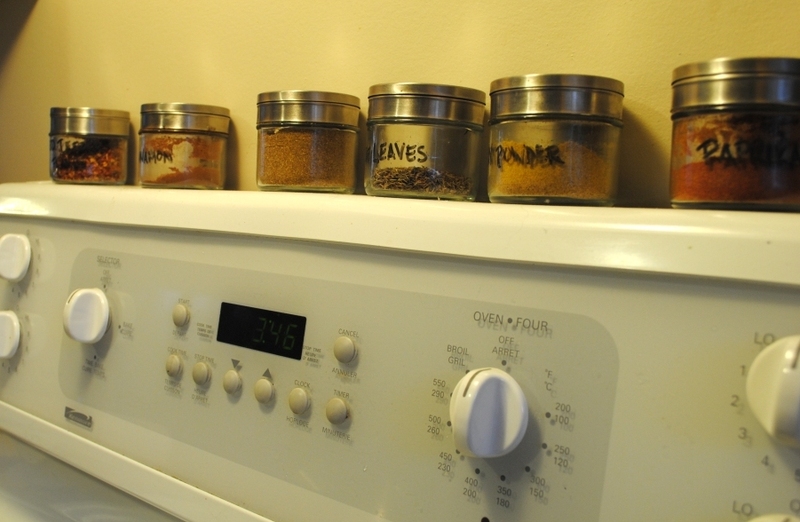 Since I’ll always have the same spice/sugar in the jar, I don’t foresee having to wash them all that frequently. Plus, if ever I do feel the need to switch it up, by using decals without the magic paper, I still have the freedom to do so. 1. I bought Avery Clear Decals, made specifically for glass or other smooth surfaces, from Staples for around $12. 2. Because it requires an ink jet printer, finding a printer was the most difficult part of this project! After a lot of hassle, I gave up and used my laser printer. It was ok for now, but I can foresee the decal rubbing off fairly quickly. For a more permanent finish, I would certainly advise using the correct printer. I chose the image I wanted, and printed it out. You’re welcome to contact me in the comment section if you’d like a copy! 3. 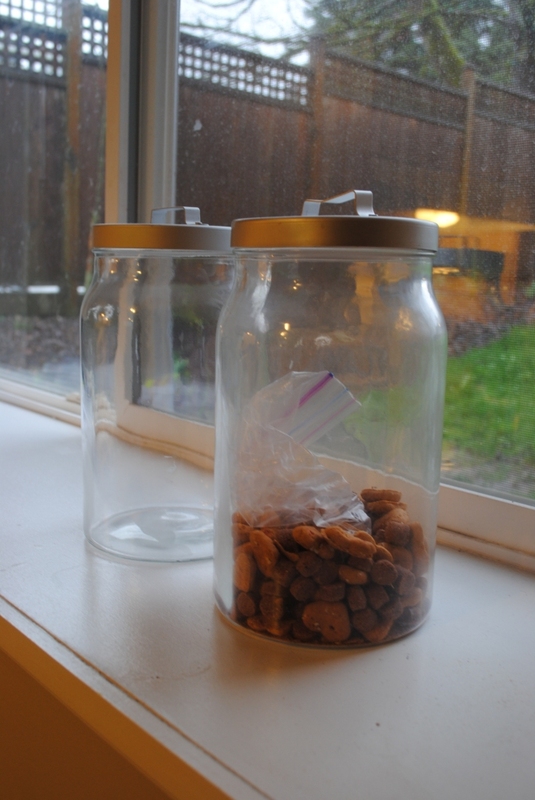 I thoroughly cleaned and dried each jar. 3. Then, I cut them up and pasted them on! That easy. It was a little tricky peeling the paper, but that was it honestly. Although I was annoyed trying to find a printer, the end result was worth it. As a side note, for this project I tried different props, lighting, angles… I’m pretty sure Shaun thinks I’m completely crazy for spending so much time taking pictures of flour. 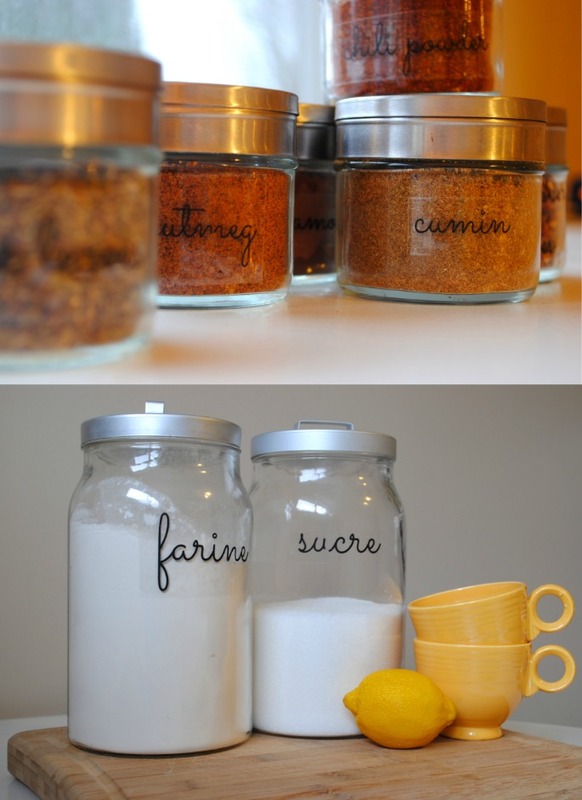 I can’t wait to see our updated Ikea baking jars on our new shelves. What about you? Any projects you’ve been dying to try? Anything you’ve found especially helpful or inspiring? 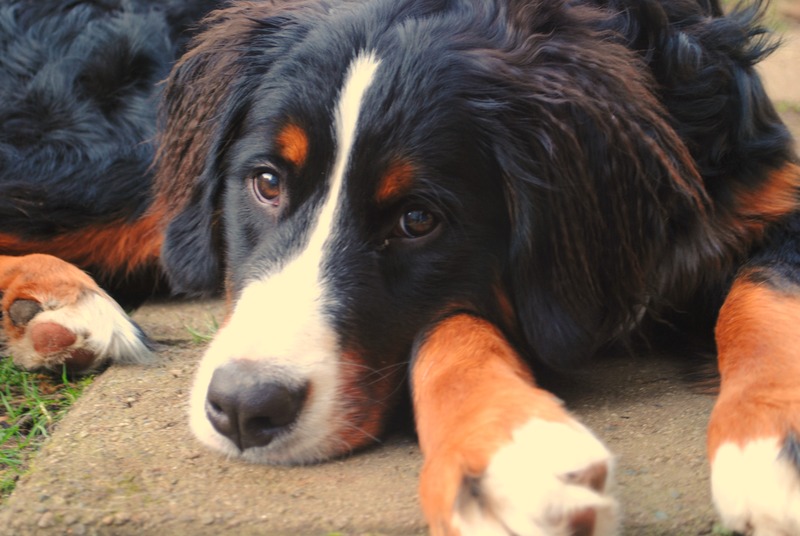 I’m always happy to hear from you! Aren’t they pretty? I thought they would be a great addition to our apartment for a few reasons: a) The kitchen is TINY and needs extra storage b) shelves are considerably cheaper than buying another piece of furniture c) they can show off my favourite dishes in the little kitchen nook area and d) they would definitely add interest to my boring walls. Lucky for me, Shaun’s painting company had some extra pieces of wood lying around. If you had told me when I was a teenager that I would spend time in my twenties leafing through piles of old wood, I would not have believed you! I never understood why my dad did it, and here I am doing the same thing. Anyway. 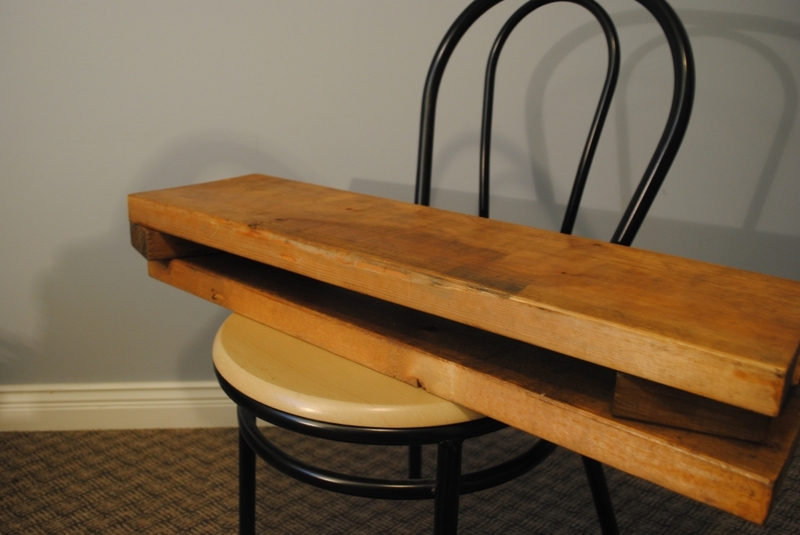 If you’re looking for salvaged wood and don’t have easy access to it, check out How Get Free Reclaimed Lumber from About.com. 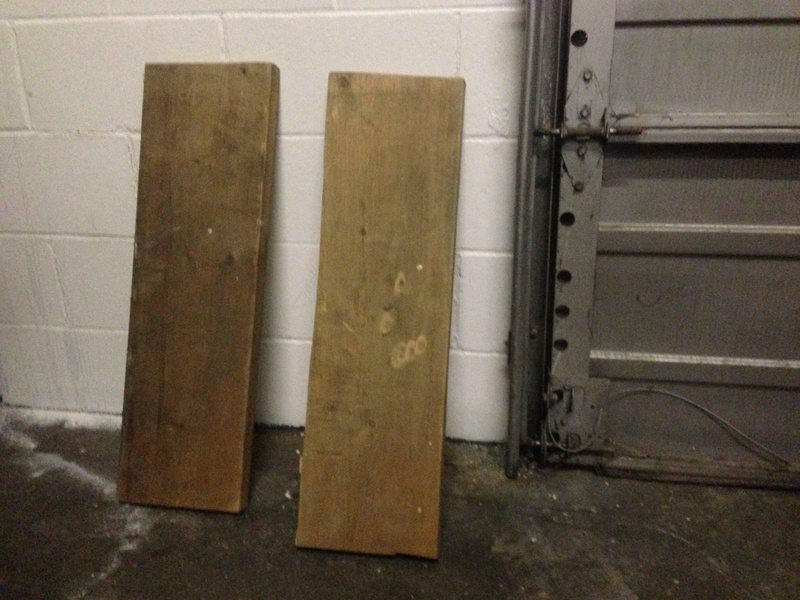 I even came across some free planks today in my neighbourhood from a new house they’re building down the street. It pays to keep an eye out for these kinds of things. For even more inspiration, check out Brooklyn to West‘s headboard made out of rescued wood from a church! (Don’t mind the poor quality; these were taken on my Iphone in a dark garage.) I think they have potential! Since the colour of the beams was a bit bland, I wanted to enhance them while preserving the dings and varied colour in the wood. After a great deal of thought on how to treat it between staining, waxing and varnishing, (by this I mean asking Shaun every few minutes and me bringing a sample to a dinner party for more opinions! ), I opted to varnish it. I started by giving both planks a very light sand with a piece 220 grit sand paper, just to avoid any slivers in the future. It’s tough to tell the difference in the photo, but I just sanded until the beams were smooth when I ran my fingers over them. Of course, whenever you sand, make sure to do so with the grain, and not against it, to avoid scratching the surface. Bali loves to hang out with me, especially when I do new and exciting things like painting… She kept photo bombing so I decided to take a few of her too! Somehow I don’t think she was all that enthused. 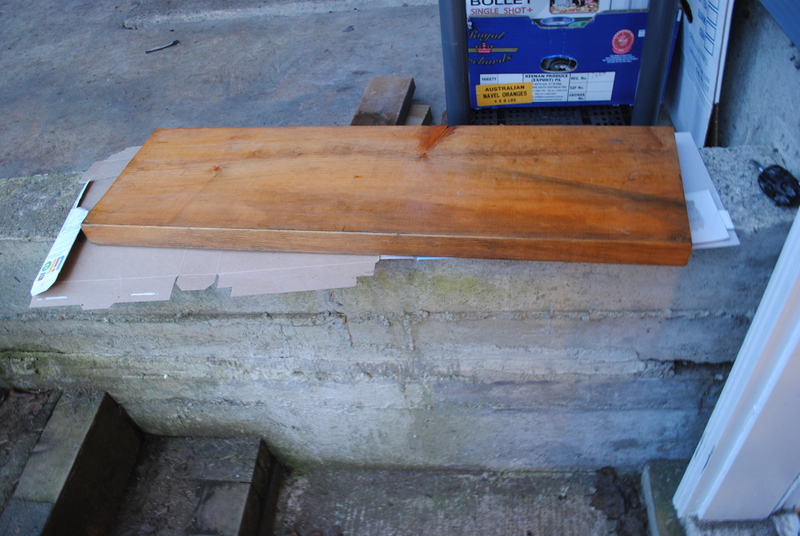 As my planks were salvaged by a painting company, there were drops of paint here and there. I kept a few minor ones, but the conspicuous ones I simply picked off with an exacto knife and sanded down. I didn’t worry too much about making it perfect, since it would just blend in to the other imperfections in the piece. I can’t wait to see the beams up against a dark grey wall with my favourite glassware and crisp white dishes! Since the lumber and varnish was at already at our fingertips, the only thing I needed were brackets, which I bought from Rona (basically the Canadian version of Lowe’s, I believe) for 5.50 each, and I bought 4. With tax, my total came to $25. 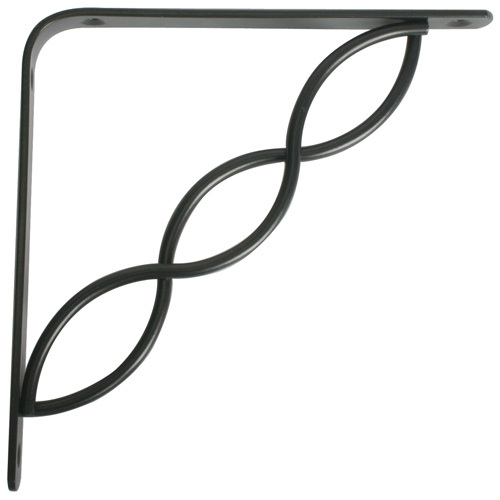 However, recreating these shelves without knowing a painter would still be budget friendly: find the wood from a barn or around your neighbourhood, get a can of varnish from Home Depot for around 15, and you’re still looking at a 40 dollar project. Not bad for some badly needed style and storage in a small space. Keep in touch for the reveal when we move in early April! Adorable, but I could hardly justify the $300 price tag! Doesn’t really look like it could store all that much either. So I hit up my local thrift shop, and found this! I sanded (120 grit), primed and painted it in a fresh coat of white paint. I found using a small roller was easiest on the large sections, and a craft paint brush for the more detailed areas. To do the doors, I used a stiff craft brush and painted it like I would a stencil. I found this the best way to get into all the cracks and crevices. 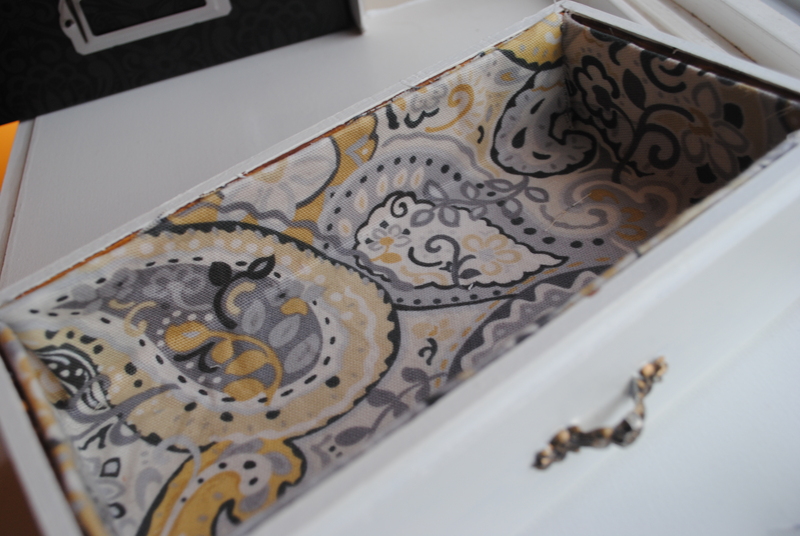 Tip: I primed and painted both the drawers and the inside of the box itself. 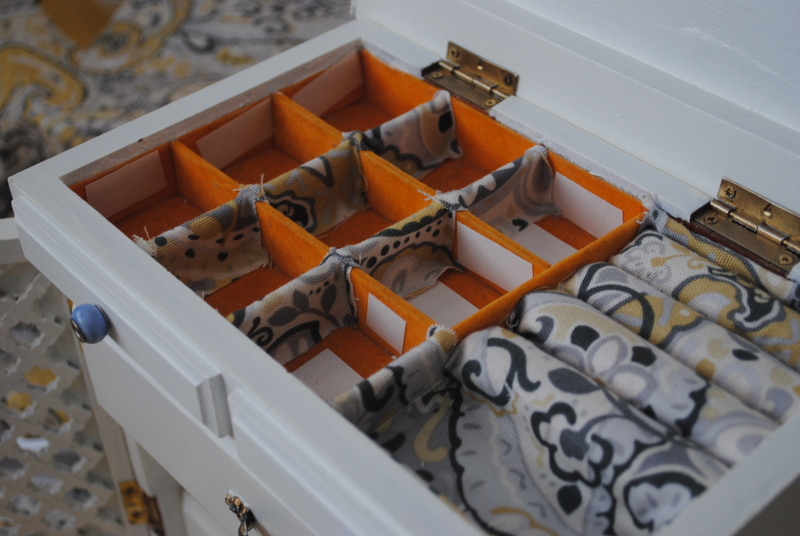 Unfortunately, this added a thick extra layer, and the drawers can get a bit sticky. Knowing this, I would only have painted the drawers, not the inside. Time saver too! 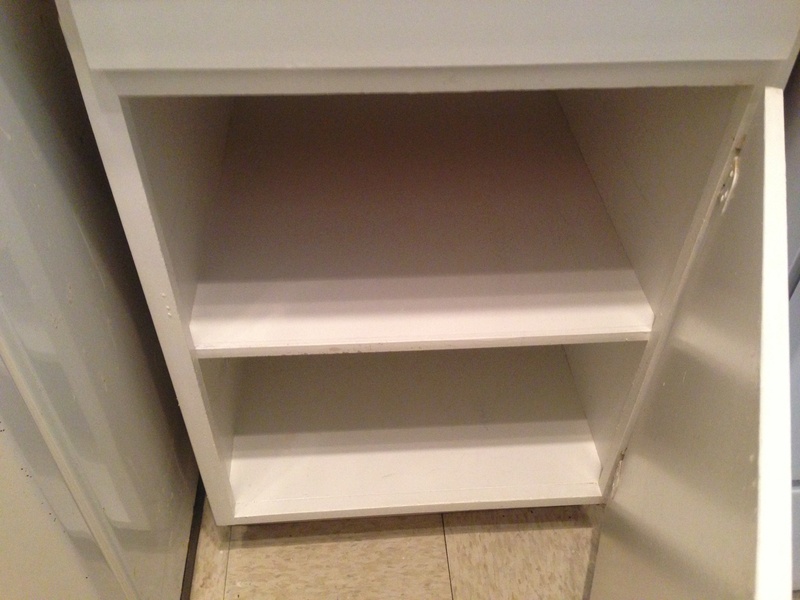 In terms of hardware, I unscrewed the doors and lid while painting, but I did leave the pulls on the doors and drawers. They just seemed too old and fragile to tangle with. I painted around them as best I could, and then touched up with a gold art pen. Since one of the top pulls was broken, I broke off the other and replaced them with beads. Looks lovely from the outside, but on the inside, you’re still stuck with this unsightly and ageing orange felt. Not nearly as bad as before, and somehow the camera makes it look more flattering than in reality, but all in all, it needed to go. 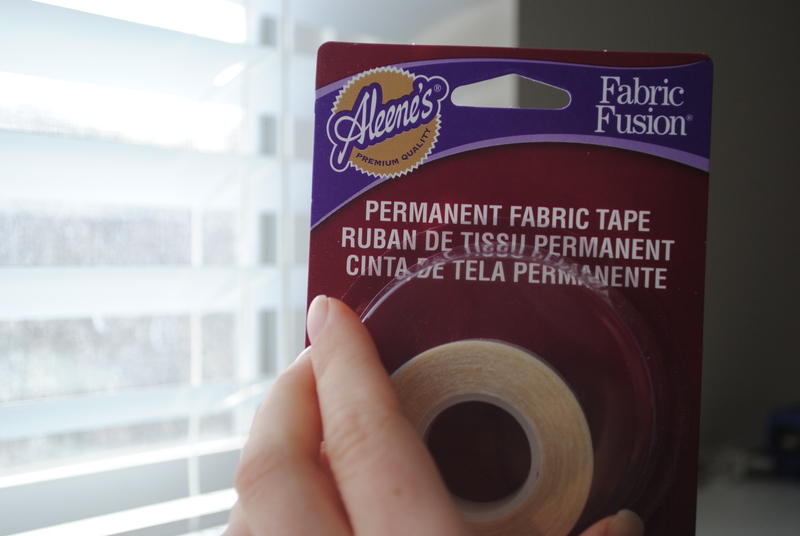 I used Aleene’s Fabric Tape to adhere my fabric to the felt. In using a dry adhesive, I wouldn’t have any glue seeping into my pretty new material. 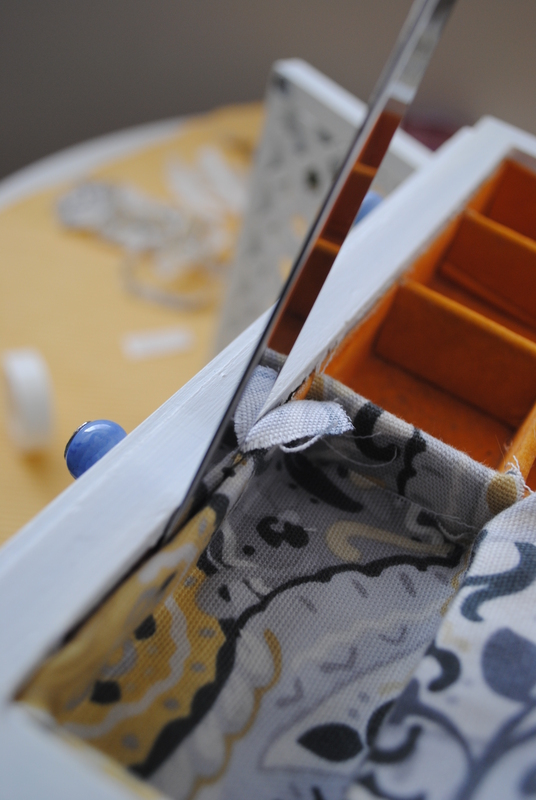 First, I measured out the amount of fabric I would need, and pushed it into the box like it would later sit. This way, I could tuck the corners behind to make a box. 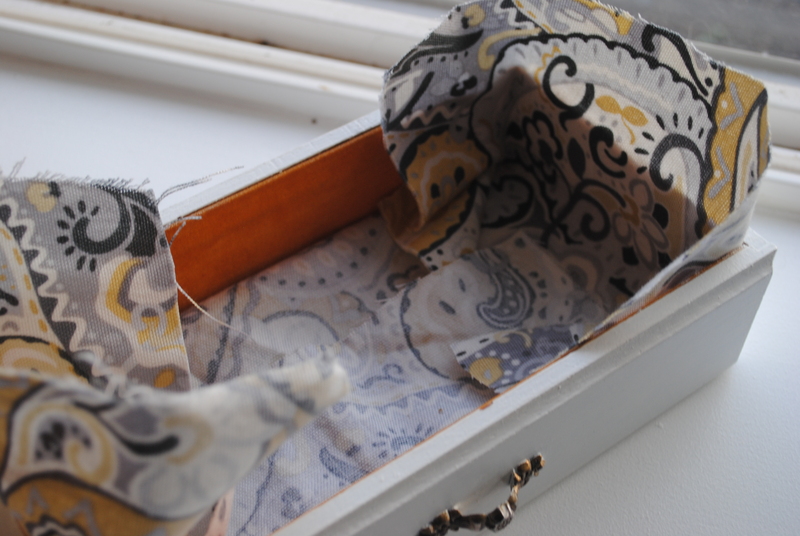 The shorter sides of the drawer had the excess fabric, so then I could tuck that behind the larger sections. I attached the bottom of the drawer first. 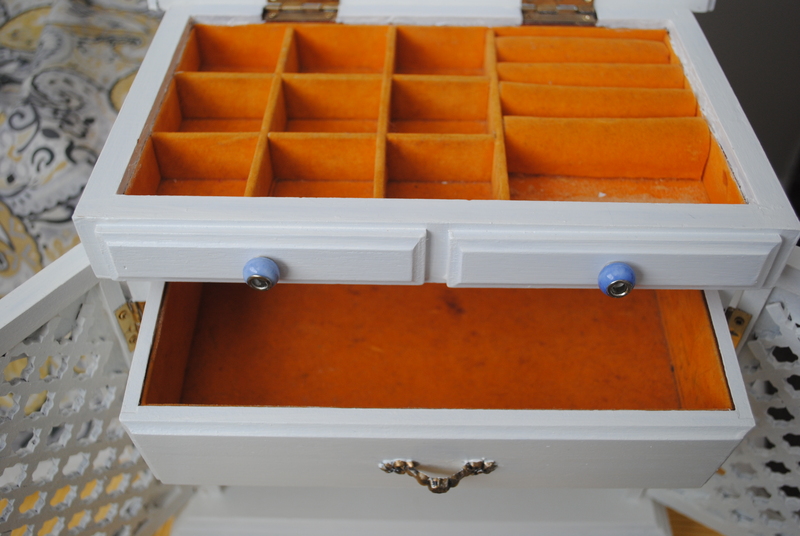 Then, I adhered the shorter sides in place, with the ends branching over to the width of the drawer. 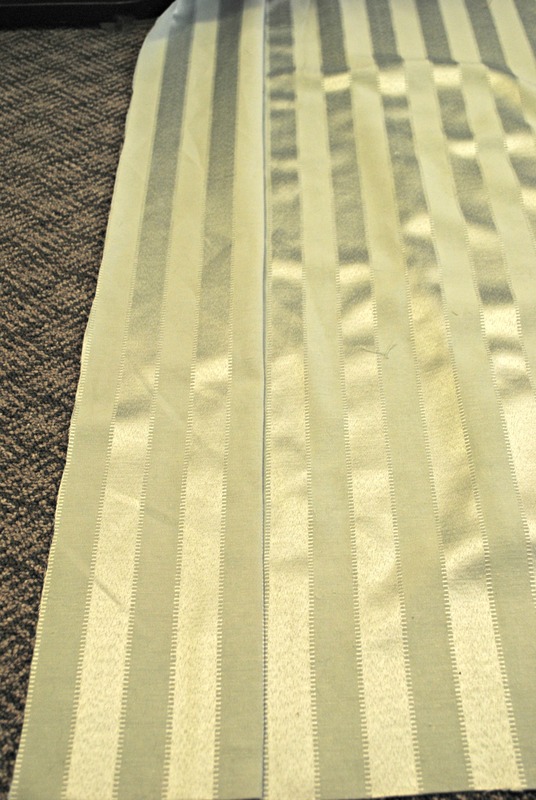 I finished the longer sides too, cutting any excess fabric if needed. I made sure to keep about half an inch at the top to tuck behind the orange felt. I pried open the top end of the felt with a basic kitchen knife, and then pushed the new fabric into place with the knife. To do the top section, I followed a similar process, with a bit of tweaking. First, I removed a few of the ring “holders”, since I don’t wear many rings. I adhered one piece to cover the left and right sides of this section. Then, I cut a piece long enough to cover that section vertically, as well as all the ring holders. Using the tape and my knife, and pushed and adhered each section in place. 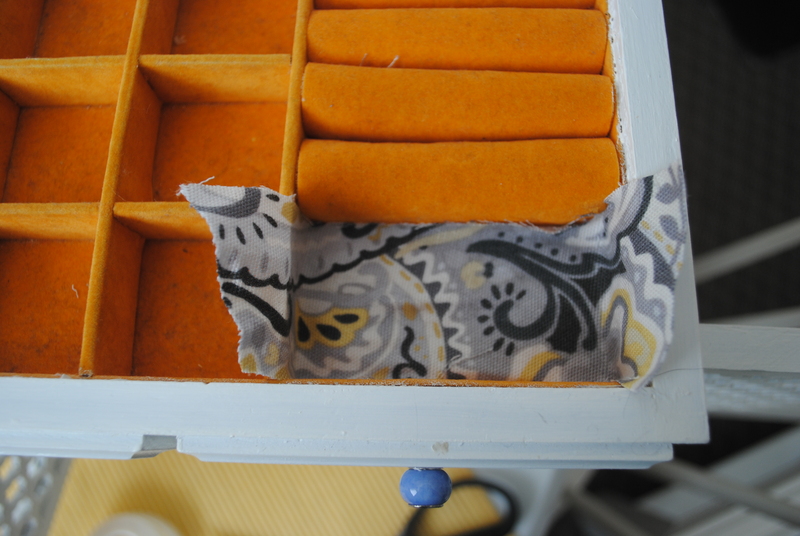 Like I did with the drawers, I pried off the orange felt with my knife, and the pushed the new fabric in place. 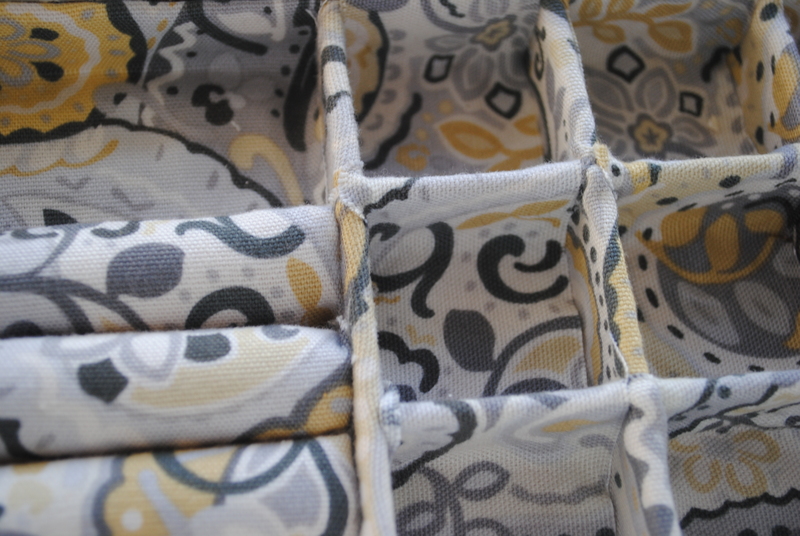 To cover the square sections, I adhered small square strips of fabric to cover the sides. Then adhered strips to the other sides and bottoms. The strips were long enough to fit all three squares and were the same width as one square. 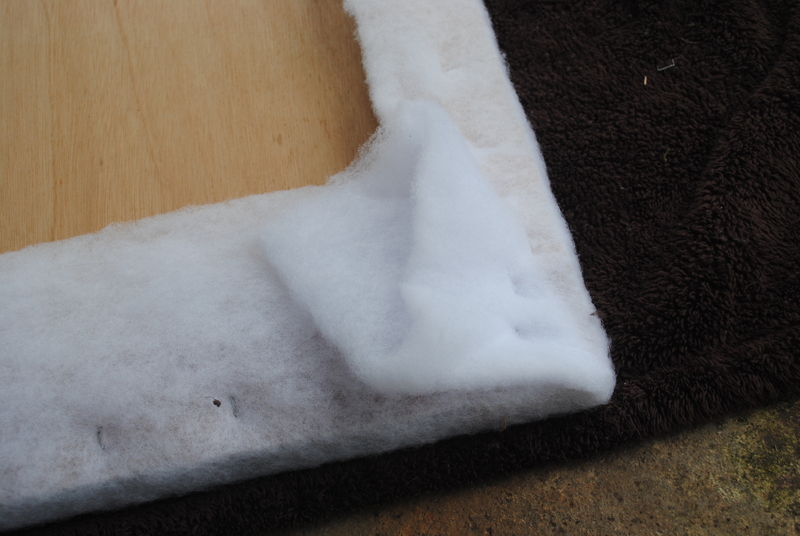 To finish off, I trimmed any extra thread and glued any loose sections. 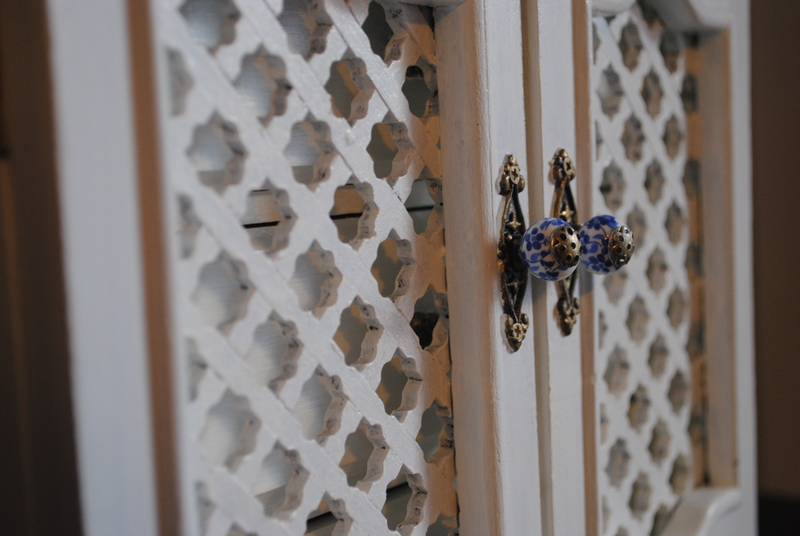 I added little “handles” using beads to polish off the doors (the glue was E6000 from Michaels). I am thrilled with the results. 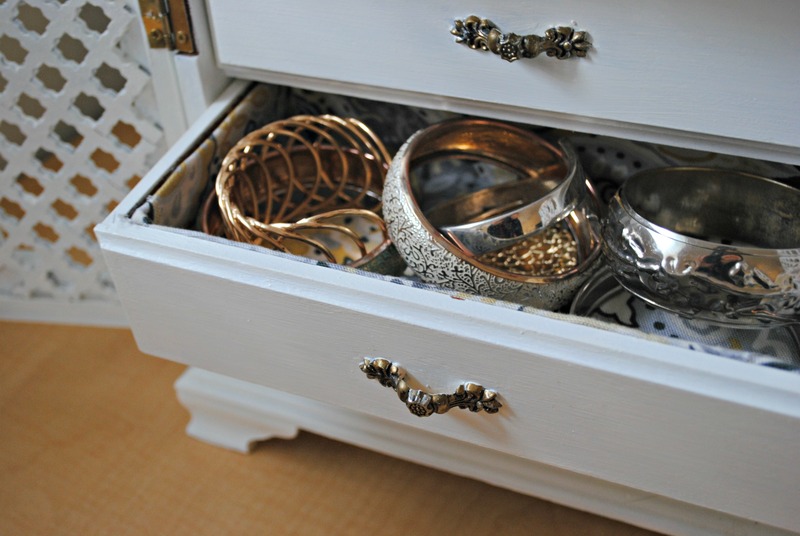 As an added bonus, the top section sorts out my jewelry so much better than plain old drawers, so I can easily find the piece I’m searching for, without having to worry about a knot of necklaces. Completely worth the effort I put into it! 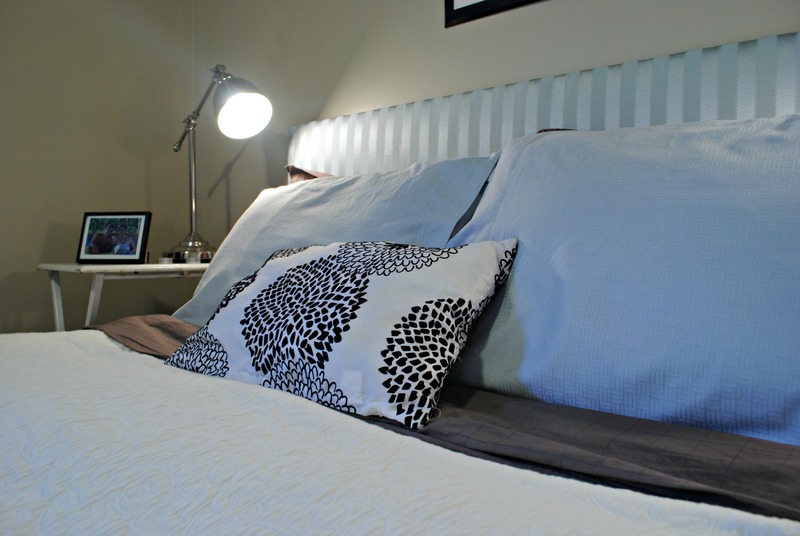 In yesterday’s post I explained how my dad and I built a headboard frame inspired by YHL (see theirs here). Now that we’ve gone over the functionality, let’s move on to the fun part! Scroll to the end of the post to see my (glee-filled!) finished project. 2. 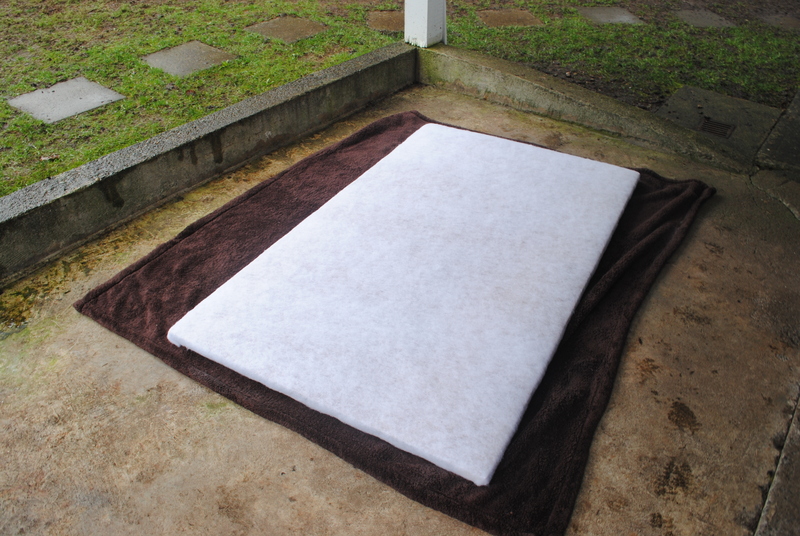 Lay out your batting and place the headboard on top. Staple a few times on one side using a staple gun. 3. Flip it over. You can see here that only one side is loosely attached to the board. 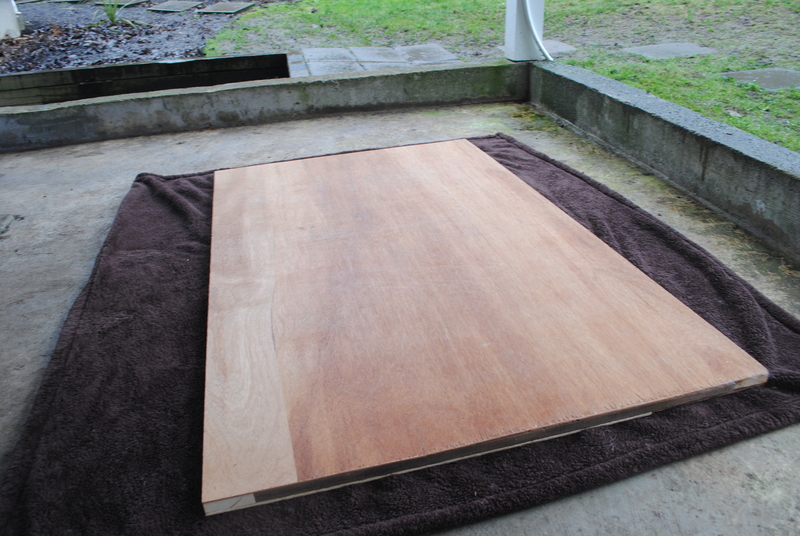 Next, spray adhesive, following the can’s directions, to evenly coat the board. This will prevent the batting from sagging in the future. 4. Flip it over again, and staple your batting in place, making sure that it is taught. Here’s a photo of one of the corners. Fold it as if it were gift wrap. It can also help to cut off excess batting here to avoid lumps. 6. Make sure the batting adheres to the board by smoothing down with your hand. I decided not to spray the batting, but it might be helpful to do so. 7. While my adhesive dried outside, (I wanted to avoid the fumes of both the adhesive and the blanket indoors), I prepped my fabric. Tip: cutting in a straight line can be tricky with so much material. 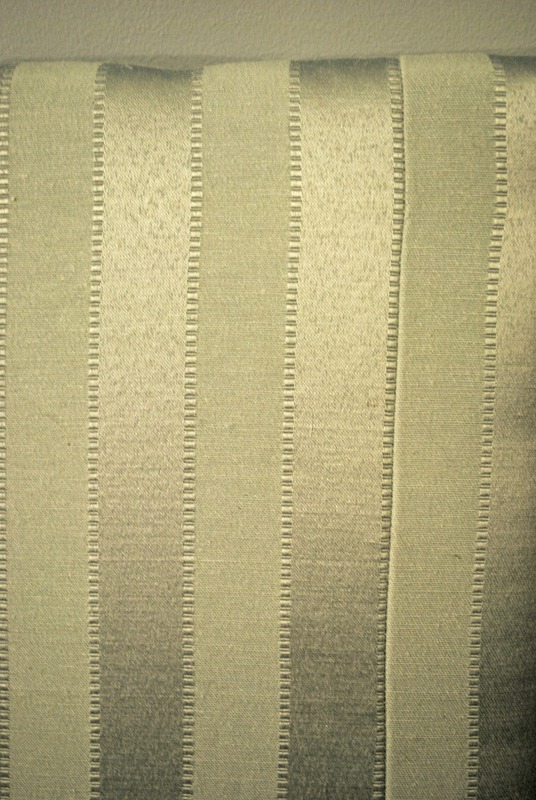 To make it simpler, lay your fabric flat on an (rectangular) area rug, and line up the side with the side of the wall. This way, you’ll cut at a 90 degree angle and can use the rug as a guide for your straight line. 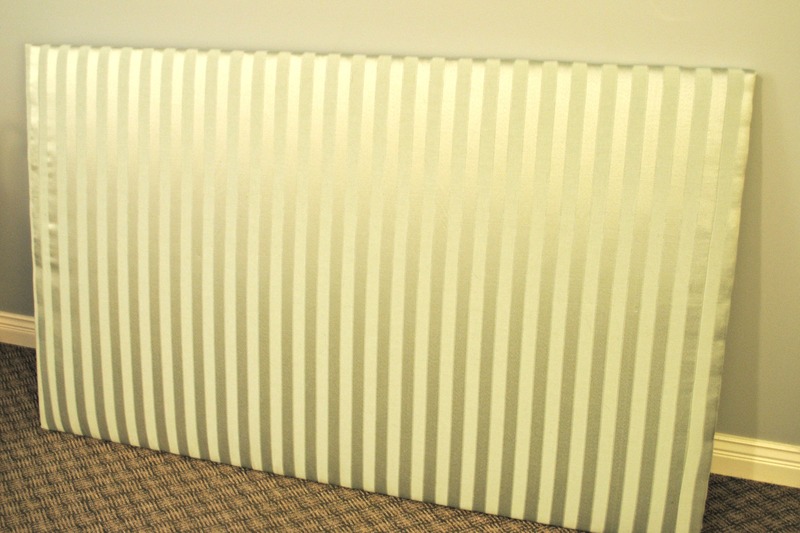 Sew your panels to the sides. 9. 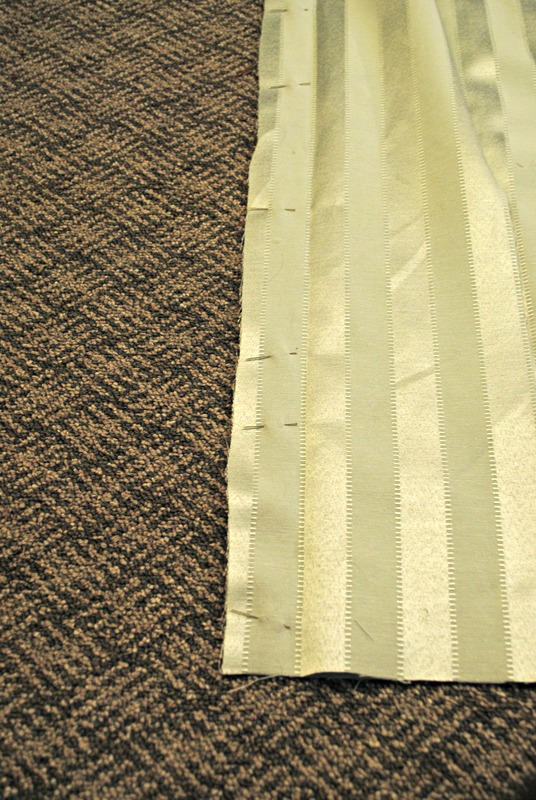 Following the same steps as you did with your batting, staple the fabric in place. 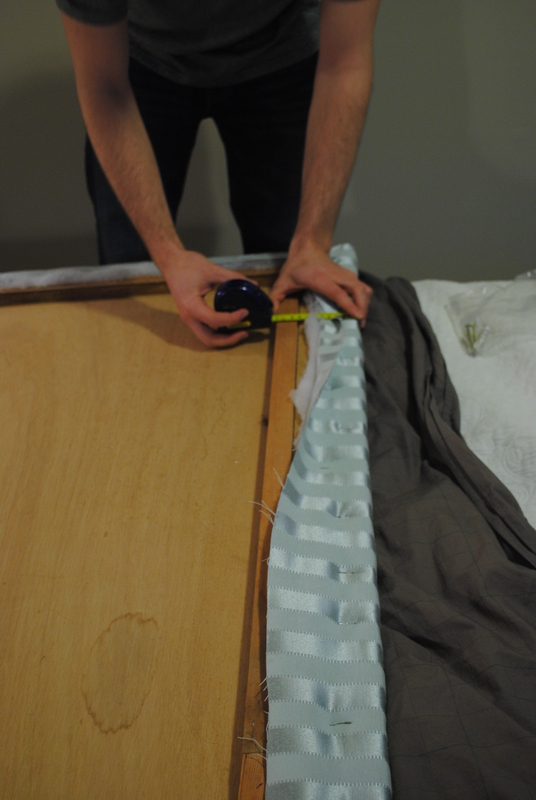 Extra staple gun tip: You need to put your body weight into stapling to keep them flush to the wood. If this is a challenge for you (as it is for me, mine tend to come out all wonky) just hammer them in a the end so you don’t damage your wall later on. Because it’s pulled tight, you can hardly see my seam! Lucky for me, my indulgent bf helped me out with this one. Here’s what we he did. 1. Decide where you’d like it to be on the wall, and mark it with a pencil. 2. 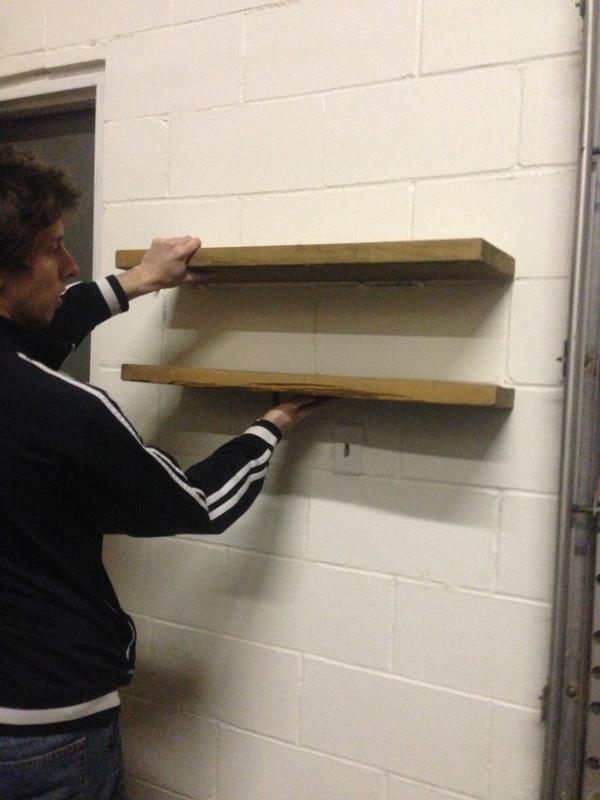 Measure how far your ledge (the part you’re going to hang) is from the top of your board. 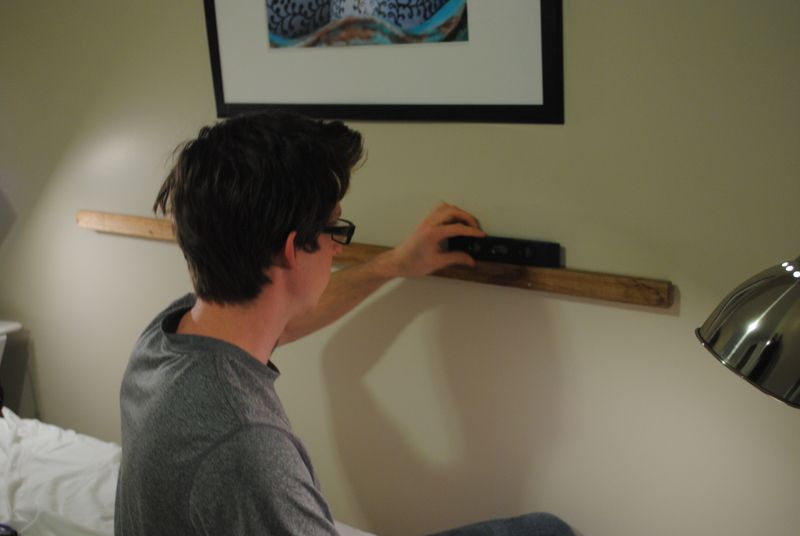 Use this measurement to know where to attach your ledge. 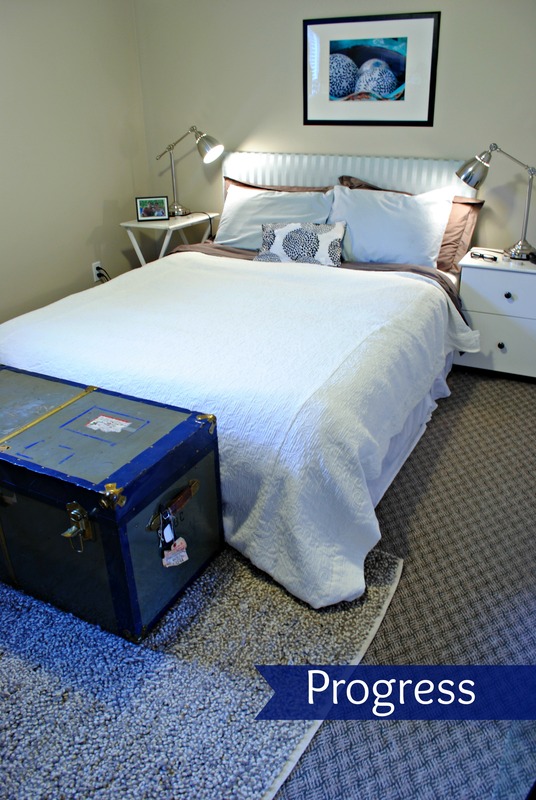 And… ready for it… Here’s how our bedroom looks now! 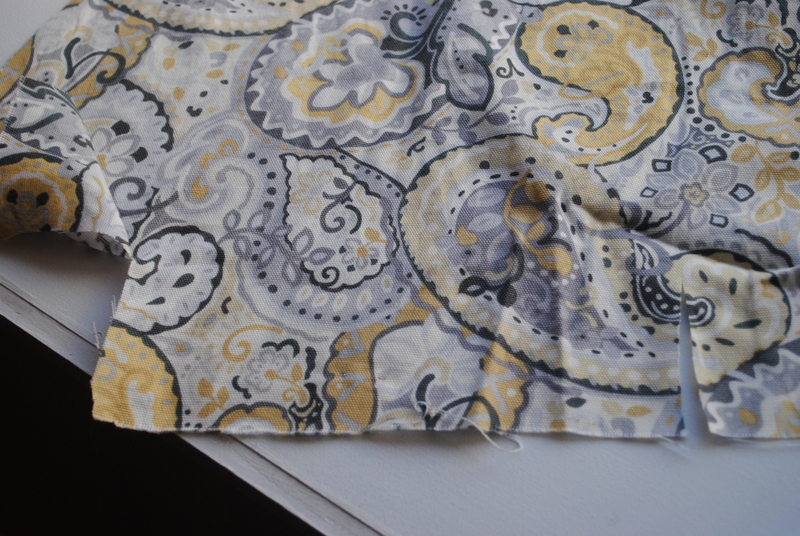 Fabric: $8 a metre (woohoo for 50% sales at Fabricland!). The sales woman advised I buy 3 meters, but I could easily of gotten away with two. 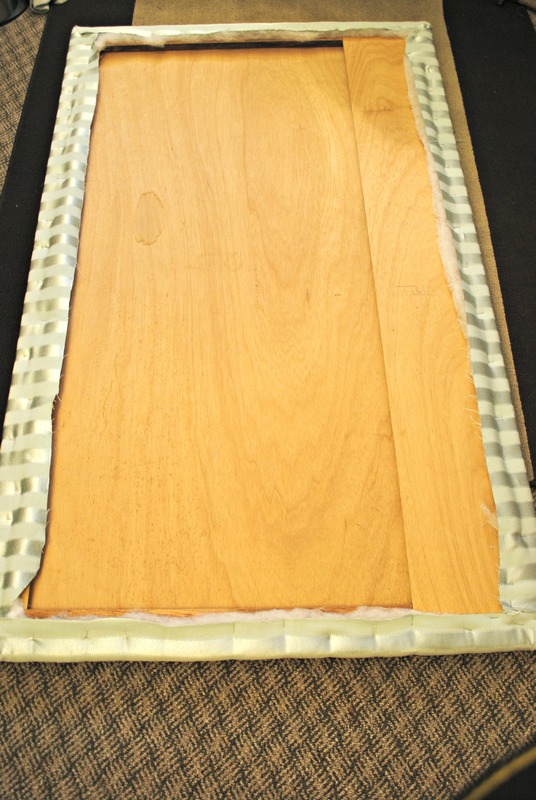 Wood: Free (though I’m sure buying a frame wouldn’t break the bank) To see how much you need, check out Part I of this project. Total cost: $34 plus tax. Love! Any projects that you’ve been putting off for a while? Anything you’ve been over-the-moon happy about when you finally got around to doing? Hi there! I’m Lauren. Welcome to my little DIY diary about making our rental our own. I strive to repaint, recover or recreate as much as I can to make our place home, while keeping it green, budget-friendly and totally transportable.